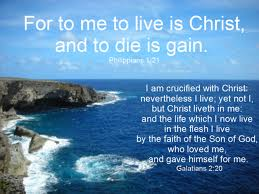 “To me to live is Christ and to die is gain” (Phil 1:21). Here St. Paul considers as gain, a thing which almost every human being considers as loss. When a saint or a good man dies, people generally consider it as a loss but Paul sees through his spiritual eyes that death is a gain for him, for heaven, for all the glorified saints, and hence for all of us. Paul says, “To me to live is Christ and to die is gain,” but for some people it is the other way round: “To me to live is self and to die is loss.” Their earthly riches, possessions, enjoyments, ambition, name and fame, will all be lost for ever once they die, and they do not know whether they have any hope or joy or anything worth rejoicing in, after their death. If death has to become a gain to us, there are three things which we need to count as loss, as Paul did. “What things were gain to me, those I counted as loss” (Phil 3:7). The earlier two verses, verses 5 and 6, speak about seven things that Paul counted as loss for Christ. In a sense, these seven things speak about all our boastings in the flesh. Only Saints who have renounced the things of this world and live for Christ can shout and say, “Death is swallowed up in victory. O death, where is thy sting? O grave, where is thy victory?” The things we boast about, including our glorying about our spiritual life, will ultimately bring great loss or disaster to our spiritual life. If you live for yourself the very word ‘death’ will give you fear, worry, sorrow, anxiety and pain. Dear child of God, have you come to the spiritual state in which you can say from the heart with Paul, “For me to live is Christ and to die is gain,” or are you afraid of death?